Given the equivocal nature of the evidence coupled with the desire to draw hard lines between ideas, I can sympathize with the sentiment that static stretching should be avoided. However, a quick glance into other sports outside of endurance and into the realms of sports like gymnastics2 and dancing3, shows the utility of static stretching, but in the correct contexts and for appropriate reasons. If it is used with such success in other sports, why is the world of chronic, repetitive athletics excluded from the same benefits? If our primary objective is the creation of well-rounded and resilient movement artists, why should any stone be left unturned? The effects of stretching, particularly static stretching, on each one of these outcomes has both support and disapproval. It’s hard for me to believe, but with all the years of searching into the underlying causes of muscle cramps, we still have no idea4. It is appearing quite unlikely that they are caused by dehydration or electrolyte imbalance (except in extreme cases)5. If you’re not into pickle juice,6 but still want relief from these painful attacks, then stretching is actually a legitimate, albeit banal, antidote. However, the relationship is fuzzy. It seems that if you haven’t been keeping up with your mobility regularly and expect to prevent cramping in a session by a few stretches, you’re likely to be disappointed.13 But, it appears that keeping your body more mobile in the long-term will decrease your likelihood of cramping during your training sessions. On the other hand, stretching does not contribute in the way you may think to cramp prevention. I know I’ve been told (as a master’s student in exercise physiology) that stretching inhibits Golgi tendon organs (GTOs) and thus reduces cramping by preventing an automatic tension in the motor unit. However, this appears to be false according to a 2014 study by Kevin Miller and John Burne7. They determined that while people who can induce cramps have active GTOs in the development of the cramp, the use of prophylactic static stretching does not appear to have any effect on these reactive anatomical structures. This does not mean that stretching won’t help, but that we have more work to do until we understand them and how to affect them. If you are looking to improve your range of motion, stay after an injury or because you want to be able to generally perform better, stretching will certainly help. For example, after working with hundreds of people on their functional movement, I can say with certainty that most endurance athletes, especially males, display poor posterior chain flexibility (hamstrings, glutes, calves, etc.). They tend to score low on the active straight-leg raise in the Functional Movement Screen, a proxy for hamstring, hip, and posterior chain mobility. Shingo Matsuo and colleagues in Nagoya, Japan found that stretching for either 3 or 5 minutes produced the greatest benefit for those seeking improvement in this specific test8. If you’re not into that duration of discomfort, stretching at a greater intensity for a shorter time, while potentially more dangerous, could produce similar benefit to range of motion according to a 2015 study led by Sandro Freitas of Portugal9. Digging a little deeper into the details of the study, the team actually found a difference between stretching for duration versus stretching with increased intensity. Increased duration appears to have an effect on decreasing the resistance of muscles to a stretch while increased intensity improves the joint angle better. While that sounds appropriate for increasing range of motion, there’s still the possibility of performance problems. In a recent review, David Behm and colleagues elucidated that simply putting the static stretching within a warm-up that also includes dynamic activity after the static stretch both increases range of motion and decreases injury potential without subsequent deleterious effect on performance10. One of the studies highlighted in the review showed that beyond a simple “traditional” warm-up of easy cycling before a cycling performance, placing static stretching (with sets of only 6 seconds) between two bouts of easy cycling resulted in an improved performance along with improved range of motion11. The physiologist in me wants to know why. Intuition would tell us that improved range of motion comes from longer muscles. In the mid-1990s, contrary to what we might have always been led to believe, improved range of motion appeared not to actually change the tissue properties and instead was linked with an improved stretch tolerance. Is it just that we are better at dealing with the pain when we see an increase in range of motion after long-term stretching protocols12? With a more current understanding in this regard, more sarcomeres (muscle fiber units) in series are indeed added after chronic stretching (yes, the muscle and surrounding tissues do become longer), but in response to a complex interaction of mechanical tension and reaction from the nervous and immune systems13. The pulling and tugging we do on our tissues may build more tissue and probably ends up putting less pressure on those nociceptors (pain receptors). In a November 2014 review of the extant literature on stretching and injury potential showed that while there is no completely definitive evidence either way, a sport-specific stretch and warm-up protocol was the best for prevention of injuries14. In his review, David Behm did determine that stretching within a warm-up that also includes aerobic activity does produce favorable results on injury potential.9 Futhermore, there is still evidence that it can help with long-term injury prevention through the recovery of tissue after the stretch. Essentially, stretched tissue becomes more hydrated after the induced tension, facilitating the inflammation and repair processes15. I’ve heard many trainers tell athletes, “Stretch so you won’t be sore,” or when stating that they are already sore, I hear trainers ask athletes in a patronizing tone, “did you stretch?” I’ve fallen victim to it myself, especially with the newly popularized (not new) idea of myofascial release (e.g. foam rolling) that does work16,17. The idea of stretching to prevent DOMS was originally proposed in the 1960s, but disproven in the 1980s. And continues to be disproven. Neither static stretching or proprioceptive neuromuscular facilitation (PNF) stretching appear to help with DOMS. The authors of the study take it even further and state that the stretching may actually make the pain more severe in some cases21. DOMS is usually attributed to microtears in the muscle architecture22, so this should not really come as any surprise, especially given the revealing work by Schleip over the past few decades indicating that stretching may make “knots” or adhesions in myofascial tissue worse8. Incidentally, if you are looking for help in dealing with DOMS discomfort, I suggest trying some “unconventional” strategies such as hyperbaric treatment23, branched-chain amino acid supplementation with taurine24 or glucose25, caffeine26, and curcumin27. I find the ideas surrounding fascial science intriguing. Especially that it could be linked to movement dysfunction and generalized pain issues28 through its own contractile abilities29,30. In fact, long-duration (from a practical standpoint though the article will state differently) static stretching of 10 minutes after repetitive cyclic motion (i.e. running, cycling, swimming, etc) may actually prevent the knots that limit and therefore alter our movement patterns31. Stretching for longer durations in this manner decreases procollagen production. While that may sound like a bad thing, the authors of the study suggest that this downregulation causes collagen fibers to align in a more beneficial pattern, even though the repair may take longer. This is some of the best evidence I’ve yet to uncover as to why we absolutely should be static stretching after our training sessions- and for a long time (5 to 10 minutes per position). In fact, to see the greatest changes in functional range of motion, fascial stretching of one to two times per week for a period of 6 to 24 months appears to have holistic benefit32. Honestly, the topic of fascia as related to function goes well beyond the scope of this article, so I will leave that alone for now. What are you about to perform? What are your biggest limiters to for the actions you are about to perform? 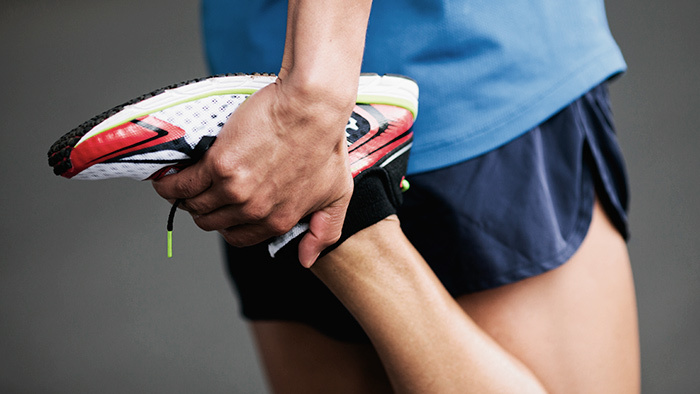 How long do you have to stretch (and how long do you actually stay in a stretch)? How long after your stretch do you need to wait before trying to perform? I’ll attempt to shed light on the answers to each of these in succession. Static stretching has been shown to have negative consequences when performed before particularly explosive activities34 and may affect performance in these types of movements for up to 24 hours35. Interestingly, while the underlying mechanism still evades us, we know that we have lost the speed at which our motor units fire, but the firing pattern remains intact (so at least the movement doesn’t get worse, only slower)36. As the durations of activity become greater and intensities less, the effect diminishes with quick sprints being affected37, less of an effect on 1-mile uphill performance38, and no effect on 3-km running39. Thus, if you are attempting a max box-jump or 100-m sprint, stick to dynamic work. If you’re getting ready for a marathon, don’t stress about it so much. Indeed, if we include a dynamic sport-specific set of movements before our performance, the negative effects of static stretching diminish40. With that said, if you are seeking a greater range of motion for your performance in something like practicing your overhead reach in swimming, while static stretching may impair your speed, your movement will benefit greatly in the long term4,41. Especially when combined with aerobic activity both before and after the stretch, both performance and range of motion improve5,42. Otherwise, dynamic stretching should be used before most activities43, along with static stretching and even strengthening at end-range-of-motion (a lightweight straight-leg deadlift, for example)44. A truism in the exercise science world is that, “men need mobility and women need stability.” While making any kind of hard-and-fast rule is typically unwise, there appears to be some truth in the realm of reactions to stretching. Women do not tend to display the same negative effects of static stretching as experienced by men, particularly if they are trained distance runners45, though power movements may still be affected46. On top of that, if you’re a trained male runner, dynamic stretching does have a distinct advantage for you in terms of performance47 but not necessarily metabolic cost (your efficiency)48. Your attention span might actually determine your actual stretch duration. The stretching mantras of the dominant organizations in exercise science (e.g. ACSM, NSCA, NASM) all point to particular durations of stretching being most beneficial, usually between 15 and 30 seconds. Admittedly, I am among those who felt very strongly that this was too much time and that certainly this type of stretching was ill advised. I imagined how “silly” it was to have teams of young people holding stretches for 30 seconds in each position as part of their warm-ups. I was incorrect and coaches’ wisdom prevails. It turns out that the negative effects of static stretching really are limited to durations of greater than 60 seconds and there is little effect for durations less than that49. Savvas Statilidis and Markus Tilp of Graz University explored whether there was even a difference in 15 or 60 seconds of static stretching on the physical properties of the muscle or on performance of a knee extension, countermovement jump, or squat jumps50. There was no difference. Researchers at Coastal Carolina University didn’t find a difference between 30 and 60 second static stretching on vertical jump performance, even when they specifically targeted muscles used in the movement (hamstrings, gluteals, and quadriceps)51. That’s a bummer for those arguing against static stretching before performance. It also has changed my outlook on how I program for my athletes. But, there is one variable not to be overlooked. We do need to take a break after stretching. If we do, we can shed many of the potentially negative effects of static stretching by just giving it a little time. If we choose not to, we could experience significant decrements in our ability to perform intense movements because decreased joint stability and neurological functioning52. According to the review by Evan Peck and colleagues, making sure there is about five minutes between any static stretching and performance should diminish negative impact while still achieving the increased range of motion and injury prevention effects38. That’s for the general recommendation of 15 to 60 second static stretches. For stretches that last longer than that (to be utilized when truly attempting to alter range of motion patterns), it takes about 10 minutes to return to baseline muscle stiffness after a 2 minute stretch, but 20 minutes to return to baseline after a 4 or 8 minute stretch53. In fact, a research team at Chukyo University in Toyota, Japan found that maximal isometric torque returns after 10 minutes following a static stretching bout54. When designing a stretching protocol to gain the most out of your mobility and performance, I propose the following: begin the preparation for every training session with some type of aerobic activity (preferably cycling, swimming, or rowing because running requires too much range of motion and integrity) for three to five minutes. After that, static stretch- yes, static stretch, for 15 to 45 seconds the muscle groups from which your session will require increased range of motion (e.g. lats before swimming, calves before full-range squats) one to three times. Then, perform another short bout of aerobic activity interspersed with drills that match the activity you’re about to do. Then start your session. After you’ve accomplished the session, static stretch again the muscle groups from which you are seeking to greatly increase range of motion in the long-term. Do this for 5 to 10 minutes in each position. The longer you stay in that stretch, the more effect on your perception of discomfort in that position and the greater the enhancement of your range of motion. Personally, I work on my hip adductors (groin) and hip flexors (including psoas and quads) particularly after running. As for the purported absolute negative effects of static stretching, I can no longer agree. My opinion has gained nuance. As such for anyone stating they have the absolute answer on a hotly debated topic, I urge caution. Karl Riecken is the Coordinator of Performance Testing and Exercise Physiologist at the USA Triathlon Performance Training Center-Certified National Training Center in Clermont, FL. There, he conducts analyses of athletes, from biomechanical and physiological perspectives, utilizing the data in custom-built training programs that he offers through TrainingPeaks. Karl also serves as an adjunct faculty member of the University of Central Florida's Sport and Exercise Science Department instructing courses on fitness assessment and evaluation.